The Bowdoin sails through Penobscot Bay two days after a mainmast is installed. 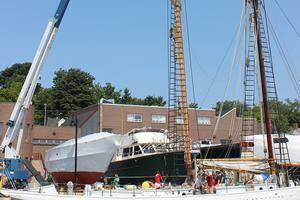 The schooner will be getting a new deck this fall. 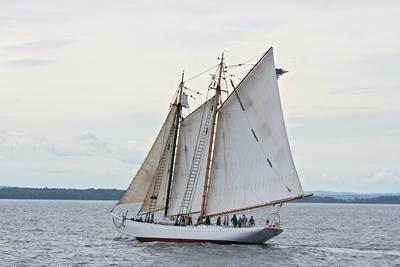 With a newly constructed laminated mast, Maine Maritime Academy’s schooner Bowdoin, a National Historic Landmark and the Official Vessel of the State of Maine, will set sail for Nova Scotia this weekend. Eleven “rising senior” academy students in the Vessel Operations and Technology program will navigate and maintain the 88-foot tall ship with the help of five crew members as part of their at-sea training during August, according to a news release from the academy. MMA had suspended sailing due to a compromise in the vessel’s main mast, discovered during a routine rigging check in late June. Bowdoin’s Captain, Eric Jergenson, and his crew assisted during the construction of the new mast by Andros Kypragoras Shipbuilding, Inc., helping to complete the mast within the 45-day construction window. The Bowdoin itinerary for the August training cruise is as follows: August 16-22, sailing to Nova Scotia with stops in Halifax, Lunenburg and Shelburne (as conditions and time allow); August 24-29, return to Castine. Maine Maritime Academy is the only college in the United States with a dedicated sail training program that leads to a U.S. Coast Guard license as mate on an auxiliary sail vessel. Students may start with no prior sailing experience and graduate with a Bachelor of Science degree, a USCG license, and all necessary certificates. The public can follow the adventures of the schooner Bowdoin throughout the sail training cruise. Visit bowdoincruise.mma.edu or follow the cruise on Facebook at Arctic Schooner Bowdoin. Updates will include a captain’s log and a hyperlink to the online vessel tracking site, iboat. The new mainmast is installed. 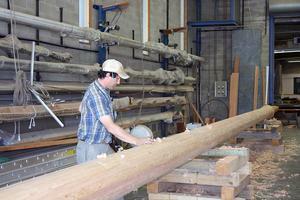 Shipwright Andros Kypragoras works on the new 65-foot mainmast of the schooner ‘Bowdoin.’ on August 8.